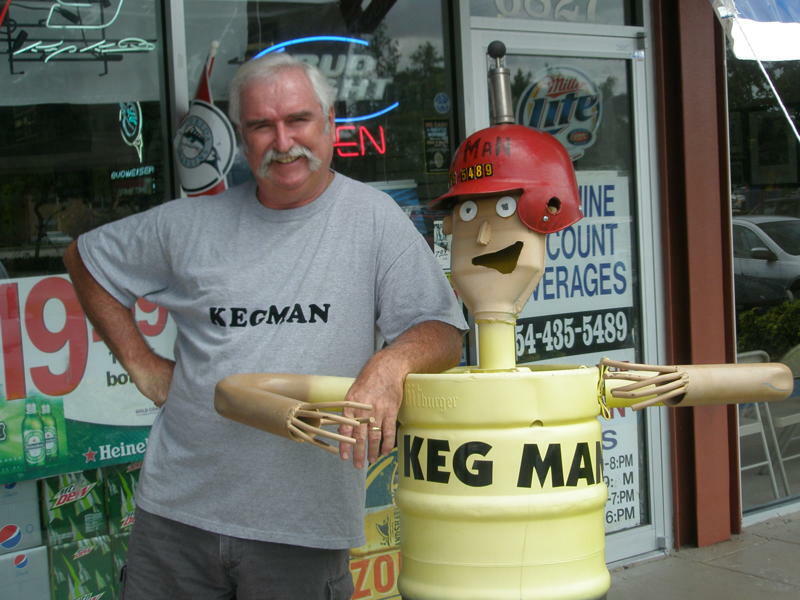 Sunshine Discount Beverages "Home of Kegman" is South Florida's #1 keg retailer. First in sales, stock selection, experience, expertise and supplier of the freshest kegs. Multiple deliveries weekly and a strict rotation policy ensure great tasting beer.We feature over 60 different flavors and sizes of beer kegs, in stock, ice cold & ready to go. From the 1/6 size (about 65 glasses) to the largest (200 glasses) in both imports and domestic.We can deliver beer, ice, soda, and wine to home, office, parks, and boats. From 10 people to hundreds, Co2 systems are available for large parties.We fill Co2 tanks and our keg customers receive a large discount. We have a full line of parts for kegerators, including tap handles, beer lines, draft towers, regulators and even washers. We can help keep you're machine flowing great.Our prices on kegs start at $49.99 depending on flavor & size.Call 954-327-1818 for more information or to place an order. 1/25/2019 $30.00 Rebate on all Anheuser Busch 1/2 kegs and $20.00 rebate on 1/6 kegs! This includes Bud, Bud Light, Michelob Ultra, Michelob Amber Bock, Shocktop, Stella, Goose Island, and Land Shark to name a few. Offer good till 2/2/2019. We keep in stock the kegs mentioned above as well as Heineken, Amstel, Corona Light, Modello, Guinness on a regular basis. Hardly ever a need to special order. That's the advantage of stocking 60-70 different varieties at any given time. 11/23/18 Good morning all beer lovers! Today is Black Friday and that means Bourbon County day! We have an assortment of this year's flavors,so don't miss out. Quantities are limited so come over and see us today for some of the best beer around. 11/16/18 Its that time of year! Bourbon County beers are about to be released. We will have 1/6 kegs of this years Bourbon County Organic, Bourbon County Vanilla, and Bourbon County Midnight Orange. Stop by this weekend or call for more information. There are limited amounts available and the kegs will not be for sale elsewhere. The yearly Budweiser Holiday Steins are also here. They are a new design and they are the best looking ones we have seen in years. There are a limited amount of these kegs available at these prices. We hope to see you soon and Happy Thanksgiving! 7/27/18 We just got in some 6.1 kegerators that are selling for $399.00!!!! We were only able to get 3 at this low price so don't wait. These kegerators fit 1/2 keg, a 1/4 keg or 2 1/6 keg. Give us a call to get all the details. Thanks for all your support at the Hemingway Look Alike Contest in Key West this past weekend. The Hemingway Look Alike Society raised over $70,000.00 to benefit Monroe County medical education. And for the second year in a row Kegman was a finalist! And a big thanks to all the people who came down to support Kegman, all fifty plus! Just in!!! Dogfish 120 bottles, Jai Alai White Oak cans, and Goose Island Bourbon County. These won't last long so don't wait. 3/30/2018 Happy Holidays to all our customers and freinds. We will be closed this Sunday to spend time with our family and brand new granddaughter. 1/26/2018 Happy belated New Year!! We have a limited supply of Dogfish 120 beer in stock in the 4 packs. In the mood for something crazy? We should be have Funky Buddah Maple Bacon Porter in next week.We will have a limited amount of 1/6 kegs for around $200.00. We are also trying to get some in bottles. As always, first to call and reserve, first to get the beer. 12/14/17 We are very thrilled to announce that we have a very limited supply of Sam Adams Utopia beer! This is the 10th annual release of this extreme barrel aged brand and is limited to 13000 in the United States. It is a multi step,time consuming and complex process to brew this 28 ABV beer. Call Kegman for more information. 11/17/17 Black Friday will be the 4th annual roll out of Goose Island Bourbon County brand Stout! We will have Bourbon County Coffee Stout as well as Barley Wine and Northern Woods Stout. As always quantities are limited and it is first come first serve! We will open at 11:00 am on Friday the 24th. Hope to see you there. 8/05/17 It's that time of year again!!! Sam Adams Octoberfest kegs are now in stock. 8/03/17 Well,he did it! Kegman went to Key West to compete in the Ernest Hemingway Look Alike Contest and finished as a finialist. Quite a feat we are told. Thanks to all his freinds and family that came to cheer him on to the finals. Look out Key West we will be back next year to win!!! 6/24/17 There're back!!! $20.00 mail in rebates from Anheuser - Busch on 1/2 kegs. And they are now offering an $8.00 rebate on 1/6 kegs. Stop in soon and Kegman will hook you up! 5/22/17 Just in time for Memorial Day Weekend we have a limited amount of $20.00 mail in rebate coupons on Anheuser - Busch kegs. That's right $20.00 off to start the summer BBQ season! Enjoy the suds! 5/6/17 Newly arrived at Sunshine are 4 packs of Dogfish 120 IPA. The hopheads hoppist beer!!! 1/20/2017 Drink up and save $$$$. Come to Kegman's and buy a 1/2 barrel of any Budweiser family of beers and receive a mail in rebate coupon for $20.00! This would include Bud, Bud Lt, Michelob Ultra, Michelob Amber, Bud Select, Shocktop, Goose Island, Bluepoint, Stella Artois, and Presidente. There are a limited supply of these coupons and they are only good for a limited time, so act now. We also will be getting in the new seasonal from Kona called Kona Brown in the 1/6 barrel. We just got in from Highland Brewery their Chocolate Mocha Stout in the 1/6 Barrel, it's very good!! 12/24/2016 Funky Buddah's The Last Buffalo in the Park has just been released and Sunshine has it in stock! This bourbon barrel aged stout is 11.5% abv .This is a limited release so don't wait they will go fast. We will be closing early tonight and will be closed Sunday Christmas day as well as Sunday New Year's Day. We will be opening as usual the next day. 11/28/2016 Budweiser holiday steins are in! Please don't wait because we only have a limited amount. Bourbon county came out Black Friday and all the bottles are gone. We do have growlers of Bourbon county available. Bring your own bottle or buy one from us. Samples are also available. Sunshine Discount Beverages is the real leader of keg beer in South Florida with 70 to 80 flavors in three different sizes of beer;in stock and ready to go! We are currently featuring Khoffner's 1/6 of their Pilsner, Belguim Dubbel, and American Creame Ale for only $49.99. We have the 1/2 of Khoffner's Belguim Dubble for only $79.99. Hollywood Brewery's Ginger Flavored IPA 1/6 is $59.99 and their Summer Ale 1/6 are also $59.99. St Arnold's has a craft beer called Fancy Lawnmower; which is a summer Kolsch, is only $79.99 for the 1/2 keg. We have Octoberfest kegs in stock from Sam Adams, Khoffner's, and Sierra Nevada. Pumpkin beers are in stock as well! Sad to say all the specials listed on the 6th are sold out, but we have new ones starting tomorrow. Yeah!! On Thursday we will have Widmer Hefeweizen 1/6 for $49.99 and Green Flash La Freak Imperial IPA 1/2 kegs for $79.99 ! Also starting tomorrow we will have Khoffner's German Hefeweizen 1/2's for $79.99 and Khoffner's German Pilsner 1/2's for $79.99. Make sure you come in early for these specials, because as always quantities are limited. 8/6/2016 Some new specials to announce. YEAH for specials! Widmer Hefeweizen in the 1/2 keg is $79.99 and Florida Avenue IPA 1/2 keg is $79.99 as well. Orlando i4 IPA in the 1/6 keg is only $49.99. As always these are limited availability. KEGMAN also wants to remind our customers that we do carry Funky Buddha kegs; Floridian and Hopgun IPA. 8/1/2016 It's that time again! Sam Adams Octoberfest is here!!! We have 1/6's at $92.99 and 1/2's are $201.99. Just in time for Father's Day,we have a great selection of keg specials. 3 Daughters Bimini Twist IPA 1/6 keg is now available for only $49.99. Not Your Fathers Root Beer kegs in the 1/6 for half price, only $59.99. That price includes free Breyers ice cream. Makes a great root beer float to celebrate Father's Day! We have a limited amount of the 1/6 Green Fash Imperial for only $79.99. Also available, Green Flash Soul Style IPA 1/6 keg for only$79.99 and Green Flash Symposium 1/2 for $79.99. We have a new batch of tap handles available, cleaning kits,growlers, gift certificates, or perhaps a back up co2 tank; all would make great gifts for Dad. We have added Funky Buddha Floridian in the 1/6 keg and it is also on our growler station. Also from Funky Buddha we are carrying Hop Gun 1/6 and the seasonal Blueberry Cobbler in the 4 pk. bottles. We have a couple of new ciders in 1/6 kegs from Accomplice Brewery and Ciderworks. One is Strawberry and the other is Cidewinder. Nice drinking for those hot summer days! Just being delivered are two new brews. From Tank Brewery in Miami we have a Belguim Style Summer Saison Ale and from Amendment Brewery we have Back in Black. Both of these brews are in the 1/6 kegs. 5/13/2016 Craft Beer Week is upon us sooo: Green Flash Le Freak Belgian style Imperial IPA 1/6 kegs are only $79.99 (9.2% abv),Florida Avenue Ale 1/6 kegs only $49.99,Glades Pale Ale 1/6 $79.99, Green Flash Double Stout 1/6 $89.99 and St. Arnolds Stout 1/6 $59.99. Enjoy!! Sam Adams Rebel IPA 12 pk bottles are on sale for $9.99 as well. Sam Adams Winter 12 pk. cans are buy one get one free @ $14.99! Florida Avenue Ale 1/6 kegs are on sale for $49.99. We still have a few Starophramen large kegs on sale for only $79.99. And the Goose Island large keg is only $139.99. Hurry in and take advantage of these specials as quanities are limited! 4/9/2016 Come by and check out the used kegerator we just got. It's in very good shape and won't last long. 4/1/2016 We have some new special for the month of April. Cervecera Del Centro's Ambar 1/6 is $40.00 off! This brings the price to $79.99 for Costa Ricco's number one craft beer. Yuengling's new seasonal is in stock in 1/4 kegs. It is an India Pale Lager and sells for $59.99. A great price for a great new beer. We have Goose Island IPA 1/2 barrels for a new lower price of $139.99. 3/7/2016 Our new growler station is now up and running! We Have Khoffner's German Hefeweizen, German Pilsner, English Brown Ale, and Belguim Dubbel. From Cigar City we have Jai Lai Pale Ale. From Dogfish we have the 90 Minute IPA on draft and from Funky Budda we are featuring the Floridian Hefeweizen. And last but by no means the least we have four brews from Hollywood Brewery: Mango IPA, Light, Wheat, And the Pilsner. Bring your own clean growler or purchase one or two from Sunshine. Call for pricing 954-327-1818.